 Make the pizza crust dough and the tomato sauce according to the basic recipe. 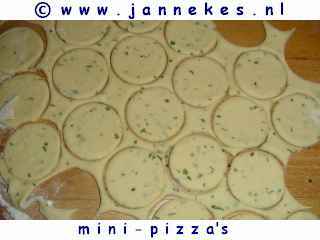 Roll the dough, on a flour dusted working surface, to a 2 mm thick sheet (in stead of a circle of 30 cm) and cut rounds with a glass . Let rise on a baking paper covered sheet. Fry the, ring sliced, onion translucent with little salt. Put the tomatoes for 10-30 seconds in boiling water, peel and cut in slices. 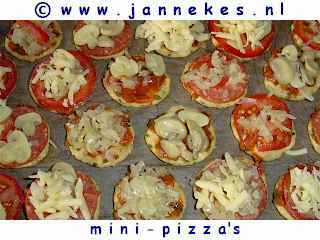 Spread the tomato sauce over the mini pizza's. Garnish, random, with slices salami, tomato slices, onion rings or mushrooms. Top with grated cheese . 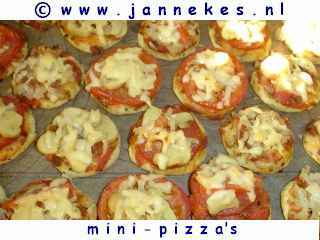 Bake the mini pizza's in the upper part of the oven about 10-12 minutes .